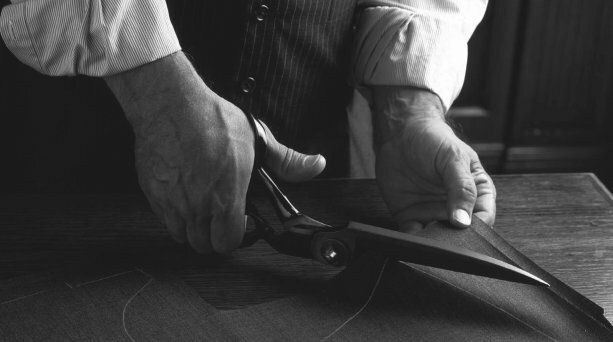 Our Master Tailor has the skills to alter your Coat or Jacket to achieve the perfect fit. To improve the fit of your coat or jacket we can take in the side seams or rear centre seam for a flattering fit. We can also shorten the length of your coat or sleeves ensuring the original stitch pattern, thread colour and any detail are matched perfectly. When shortening the sleeves of a coat we can offer two options. We can shorten from the crown (shoulder) or from the sleeve end. As professional tailors with over 30 years of experience, we would recommend shortening from the crown as the most effective way of achieving a flawless result. Working from the shoulder means that the cuff detail or ‘shams’ are not disturbed and consequently the design and proportions of the coat or jacket have remained original. We can narrow or ‘chip’ the shoulders of a coat for a neater fit or add pads to define the silhouette or even out a dropped shoulder. A ripple of excess fabric across the back neck area or ‘Square back neck’ can be removed by simply opening the back neck and shoulder seam, lifting excess fabric and re-stitching as original for a more complimentary fit on the body. We also specialise in Coat Relining. If your jacket or coat has a worn lining we can replace your existing lining with either a close resembling colour, or replace it with a colour of your choice adding more pockets or detail at your request. Zip replacement or buttons are of course basic alterations that we are happy to perform. Our highly experienced and talented Savile Row trained Master Tailors will work on your Coat for as long as it is required to make your Coat perfect. We will focus on your needs and work with you on a one-to-one basis. This means that the same Master Tailor you see at your first fitting will attend to you during all your fittings, as well as work on your Coat. As our Tailors have at least 20 years of experience, we can assure you that your Coat will be in the best possible hands. This makes us the number one choice for anyone seeking the perfect fit.